Using credentials in combination with a piece of information that only the user knows makes it harder for intruders to get access to the account. That’s why Jelastic added two-factor authentication (2FA) that provides an extra security layer. With this feature enabled, in addition to username and password, it is required to enter the code randomly generated in the authenticator application on the phone to access Jelastic account. Below we’ll describe how to enable and manage this second authentication step. 1. Go to the Settings section by clicking on the same-named button at the top-right corner of the dashboard. 2. Within the opened frame, switch to the Account tab and click Set Up Two-Factor Authentication. You need to confirm your password via the appeared pop-up to proceed. 3. 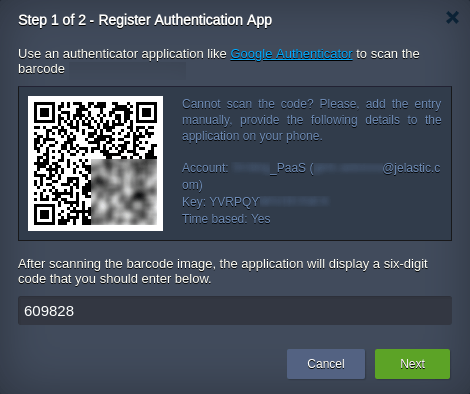 Next, you need to interconnect your Jelastic account with the Google Authenticator application on your mobile phone (if needed, follow the linked guide to help you with installation). Open the app on your device and add the account by either scanning the displayed QR code or manually typing the provided data. As a result, you’ll see the six-digit code (automatically refreshed every 30 seconds), type it into the dashboard frame and click Next to verify. 4. 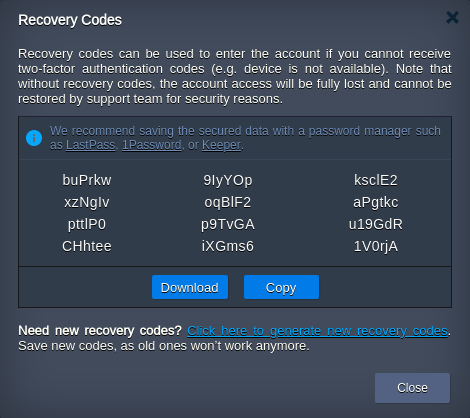 In the second step, you’ll see the recovery codes, which can be used as a one-time alternative to the generated authentication codes. Note: Ensure your recovery codes are saved. Otherwise, in case of your phone unavailability, you won’t be able to connect to your account. Also, they are the only option to restore access upon device loss. You need to tick the I’ve saved the data checkbox (automatically checked after using the Download or Copy buttons) to be able to close this window by clicking Done. 5. Now, to log into the account, you’ll need to provide the login/password credentials (as usual) and enter a code from the authentication application on your device (or the recovery code). That’s it! Your account is now protected with two-factor authentication. 1. Go to the Settings > Account section and click the View Recovery Codes button. Confirm the password for your account to continue. 2. 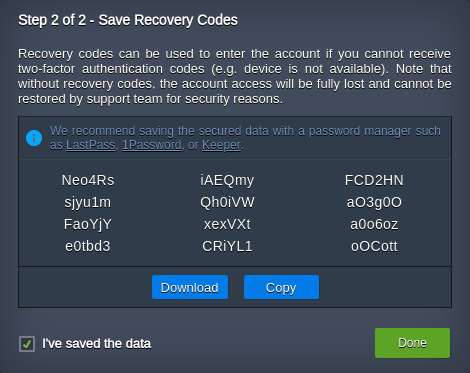 Here, you can see your current recovery codes and, if necessary, Download/Copy them with the appropriate buttons. 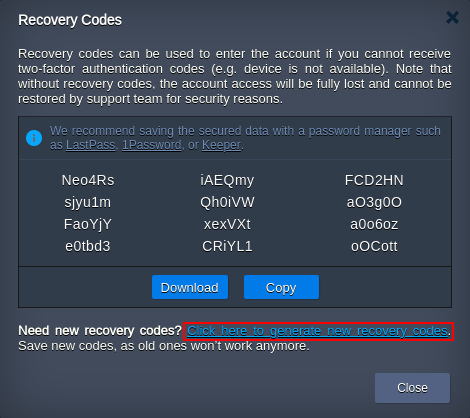 If you ran out of the recovery codes (as each one can be used just once) or if you consider them compromised, click the link at the bottom of the frame (circled in the image above) to generate new ones. 3. In the appeared pop-up, confirm the operation and, in a moment, you’ll get new codes. Don’t forget to save the displayed recovery codes with the Download/Copy buttons, as the old ones won’t work anymore. 1. Navigate to the Settings > Account section and click the Disable Two-Factor Authentication button. 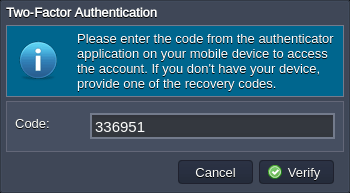 Tip: In case you want to disable/rebind two-factor authentication due to device loss, use one of the recovery codes to log into the dashboard. 2. Confirm your decision through the appropriate pop-up and provide a password in the next one. That’s it! Your account is now accessible with just the login/password credentials. In order to get a valid session for the API requests on accounts with enabled 2FA, you need to call an additional Verify2FACode method after the SignIn one. In such a way, you’ll be able to provide a six-digit authentication code from the appropriate application on your device. To avoid such complexity, it is recommended generating and using personal access tokens in your API requests and custom automation scripts. With each product release, we strive to improve the protection of your accounts and personal data. And now Jelastic PaaS is even more secure, so get started and run your applications in the highly protected cloud environments.